Do we really need another film about NASA’s extraordinary first journey to the moon? It turns out we do. However, the inventive Oscar-winning director behind Whiplash and La La Land delivers something unexpected with First Man. Damian Chazelle’s glimpse into the life and mind of Neil Armstrong is an intimate look at loss and suffering. Tragedy in the astronaut’s life propels his focus toward man’s first mission to the moon. Instead of telling this story on a big scale, Chazelle and his cinematographer Linus Sandgren (La La Land) keep the focus on the eyes, often in extreme close up so we can feel Gosling emoting Armstrong’s pain. Even the technical elements of the film are unusual; grainy imagery from a variety of film types (16mm, 35mm, IMAX), and sound design that’s guaranteed to win awards. “I married Neil because I wanted a normal life,” Janet Armstrong (Foy) admits in all irony. Neil’s focus in 1962 was split between his two-year-old daughter Karen’s brain tumor and NASA’s race against the Soviets to get to the moon. 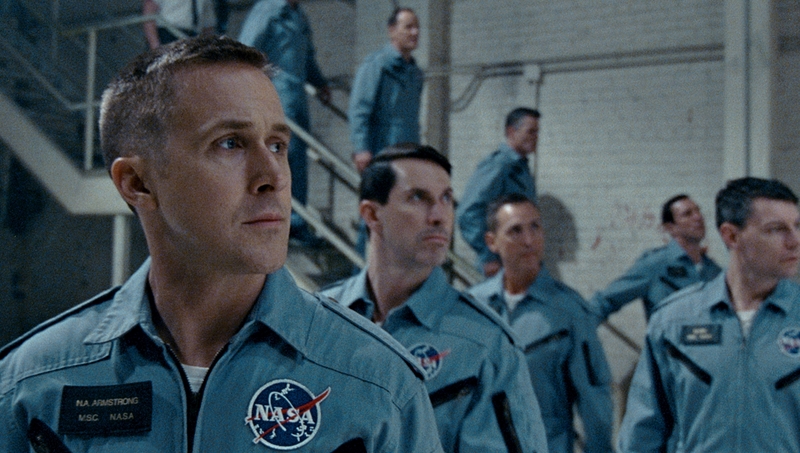 “He’s a good engineer, but he’s distracted,” superiors note when considering Neil (Gosling) for the mission all the pilots at NASA are gunning for. Following Karen’s death, the Armstrong family moves to Houston where Neil consumes himself with work, becoming someone Janet and his sons hardly recognize. After proving repeatedly how to react during the most brutal of simulations, including one that nearly kills the former war pilot, Neil is chosen to lead the Apollo 11 mission to the moon and his dedication is never questioned again. Chazelle has figured out exactly what point of view this story hasn't been told from and takes us there with the explosive creative genius we've come to expect from his talent. Don’t go into First Man expecting an action-suspense film like Apollo 13 or a buddy movie similar to All the Right Stuff, it’s neither. Chazelle, unlike a lot of filmmakers who exist in a bubble, appears to have no desire to give audiences something they might feel they have seen before. He’s done that three consecutive times now (say what you will about La La Land, but there isn’t another musical like it). First Man also carves out its own particular space. He uses a grainy 16mm camera for the majority of the story, then in the fleeting final moments when Neil steps on the lunar surface, the screen widens into an IMAX frame. Chazelle has figured out exactly what point of view this story hasn’t been told from and takes us there with the explosive creative genius we’ve come to expect from his talent. Actress Claire Foy has fully dedicated her new freedom from TVs The Crown to feature films. First Man is one of three features in 2018, following thriller Unsane by Steven Soderberg and later this winter she will fill the shoes of literary ‘Dragon Tattoo’ icon Lisbeth Sanders in the sequel The Girl in the Spider’s Web. Foy’s performance might be the most standard element to the film. She has a very good scene where her rage is vocalized, calling NASA superiors “boys” in the most derogatory manner. Yet it’s the internal performance from Gosling (something he mastered long ago in Lars and the Real Girl) that allows the audience to understand what this journey is really about. The sound design on some of the rocket tests is masterfully done. The movie shakes and jerks your eyes balls as if you were strapped alongside Neil in the violent blast off. What happens on the moon will surprise you, because for Neil it was much more than making history, planting a flag or winning the space race.